"What do you mean?" exclaimed Nicodemus. 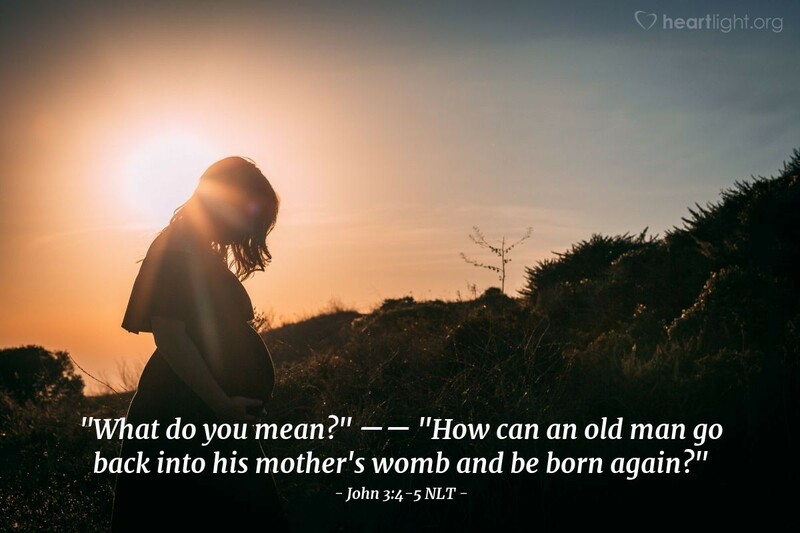 "How can an old man go back into his mother's womb and be born again?" Jesus replied, "I assure you, no one can enter the Kingdom of God without being born of water and the Spirit. Jesus has tried to move Nicodemus from a philosophical discussion to a personal one. "Unless you are born again, you cannot see the Kingdom of God," Jesus told him (John 3:3). Nicodemus tries to pull the discussion back to a philosophical one by couching it in human terms, "How can an old man go back into his mother's womb and be born again?" Jesus reminds him that "no one," not even a respected high council member and teacher, can enter the Kingdom without the water/Spirit birth. As a respected teacher, this requirement would have been hard to hear. We can hear him think in shock, "I must be baptized like a Gentile or like those miscreants that John the Baptizer is baptizing? I must have something radically done by the Spirit of God?" Yes! That is Jesus' point. Clinging to his old righteousness, surpassing others in religious practice, reputation, and effort, wasn't going to cut it with God. Only a new birth would do — a birth from above, a birth facilitated by God. He had to stop his earthbound thinking. He had to open himself to God's new work through the Spirit, or he would miss the glory of God's Kingdom. The very best that Israel had to offer couldn't enter the Kingdom without faith in Jesus and a new birth by the power of the Holy Spirit. O righteous Father, forgive me for trying to hang on to my earthbound righteousness and religious practice. I know that I could not be a part of your Kingdom without being spiritually reborn. Thank you for providing the sacrifice that atones for my sin. Thank you for providing me the means to confess my faith in Jesus and to share with him in his death, burial and resurrection. Thank you for remaking me by the power of your Holy Spirit. Please help me share this grace with others. In Jesus' name, I pray. Amen.